Here are a few tips based on medium to keep in mind when there is question for the necessity of cleaning. Never use any type of liquid, solvent, or cleaner on a painted surface unless you are a trained conservator. Paintings have complex surfaces which can vary drastically. Varnished, unvarnished, oil, acrylic, underbound pigment, previous inpainting, and old repairs all require different methods and approaches for care. I am often asked by clients if old school techniques such as bread or a sliced potato are appropriate for cleaning paintings. Although these seem like innocuous materials, they can leave a residue on the surface or mar the paint layer. For care at home, cleaning should be done sparsely. Paintings should only be lightly dusted and only with a very soft bristled brush. Dusting should not be undertaken if there are cracks evident in the surface or undulations in the canvas. Feather dusters should not be used as the ends of the spines can scratch and catch on edges. Often the back of the canvas is overlooked when evaluating the condition of a painting. The textured backs of canvases are a perfect place for the accumulation of dust. The area between the back of the canvas and the lower stretcher tends to catch debris. Trapped debris can cause damage over time, creating deformations along the lower edge of the painting and could lead to related insecurity to the paint layer in this area. A conservator should be consulted for cleaning and to address any debris caught in the stretcher. During treatment, it is customary for a conservator to install a backing board on the verso to prevent exposure to dust and debris in the future. Never apply any type of liquid or spray to a work on paper as it can absorb into the sheet causing irreversible staining, distortion, or both. Photographic emulsions can be irreversibly damaged by even slight exposure to moisture. Drawings, painted images, and inscriptions executed on the sheet may also be sensitive to moisture or dry cleaning methods, which can cause them to be smeared, scuffed, or even wiped away if not addressed properly. Due to the sensitivity of works on paper, any cleaning should be undertaken by a trained conservator. This sensitivity also warrants that they should always be framed behind UV filtering glazing using only archival, acid-free materials. When cleaning the glazing of a framed piece, never spray directly on the surface, always dampen the cleaning rag instead. You never want to allow drips or moisture to buildup on the glazing. The glazing should be cleaned with an ammonia free cleaner. Any residual moisture may eventually seep beneath the lip of the frame and under the glazing, causing damage to the matting and even the artwork within. Gilding is composed of an extremely fine film of gold or other metal over a prepared surface. If the gilded surface is handled improperly, the applied layer of gold can be easily compromised and the gold can literally be wiped away. 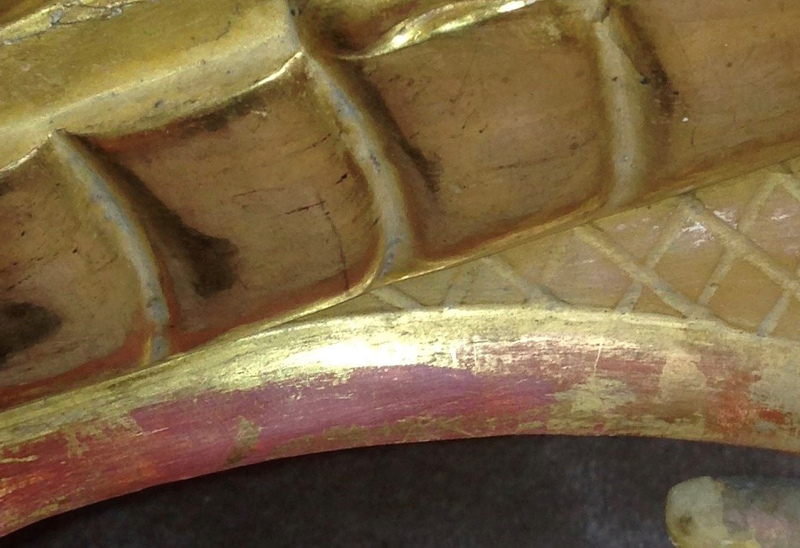 With the exception of a light dusting with a soft haired brush, gilded surfaces should be cleaned by a conservator. Gilding over gesso can be extremely fragile as the gesso can completely detach from the substrate, yet remain in place. It is very easy to accidently detach and destroy sections of gilt gesso layers when attempting to clean a piece. One technique to determine if the surface is stable is by very gently tapping a fingernail over the surface. If there is a clicking sound or the surface moves, the piece should be consolidated and stabilized by a conservator prior to proceeding with any cleaning. When cleaning the glass or mirror in a gilded frame, as with framed works on paper, never spray directly on the surface, always dampen the cleaning rag instead. If a cleaner is allowed to accumulate on the surface of the glazing, it can drip down, collect along the lower rail, and cause localized damage along the lower edge of the artwork, or silvering on the mirror. It can also cause significant damage or even strip the gilded surface that the cleaner comes into contact with. 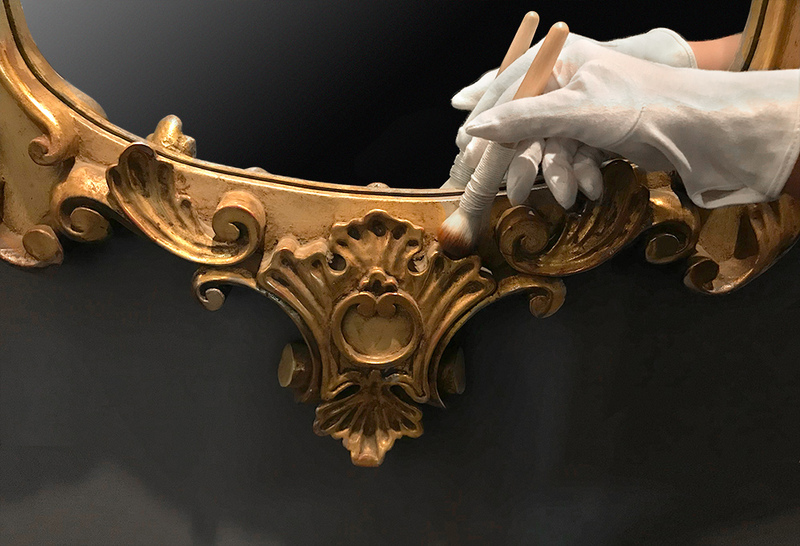 To avoid damage to the gold leaf on the frame lip, use a barrier, such as a thin piece of cardboard, against the edge of the frame while cleaning. When handling artwork and antiques, it is important to always remember that “less is more”. A subtle buildup of household dust does not necessarily warrant a full cleaning of a piece. However, exposure to other particulate matter, such as dust from construction activity or residue from smoke, should not be taken lightly. Before attempting to address a concern yourself, you should contact a conservator or specialist in the field. Working with a specialist can help ensure the most optimal results, while retaining the piece’s historical charm and integrity, and avoid the risk of potential damage. If you have questions on handling or care of your piece, please feel welcome to contact DPR Art Rescue at info@dprartrescue.com.